You shouldn't take more than three fiber gummies per day. This kind of supplement is taken half an hour before your every meal, with plenty of water. Try to drink at least one full glass of water since this is how fiber turns into a soft gel that gently expands in your stomach. This not only makes you full but also helps your body get rid of excess water and toxins. However, remember that you should start with one gummy per day, slowly increasing up to three Skinny Piggies gummies. Fed up with bland meals and boring diet programs? Feelings of restriction? Let's be clear, the majority of people don't like diet plans. It's not fun refraining from foods you love, and certainly not fun to hit the gym when you'd rather lay down the couch watching the latest episode of Game of Thrones. The good news is, now you can support your diet by indulging in remarkable, all-natural appetite suppressing supplement, Skinny Piggies! 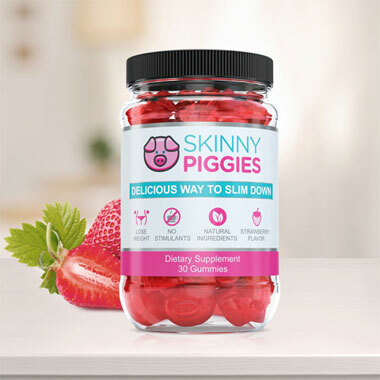 Skinny Piggies are remarkable fruit flavored supplement fiber gummies that fight your appetite and food cravings while allowing your body to stay in fat-burning mode. Sounds too good to be true? Let's take a look at what's behind fat loss. In order to achieve this caloric deficiency, you want to either boost your burned calories through extra physical activity or eat less. To achieve the best results, you may want to do both. Skinny Piggies help you eat less and minimize your caloric intake which makes achieving weight loss easier. Add in an extra daily physical activity to help step up the fat loss process. If only fat loss were that easy. Even though cutting your calories seems easy, in real life your carbohydrate cravings will probably keep you thinking about a piece of cake day and night. No more sugar binges! 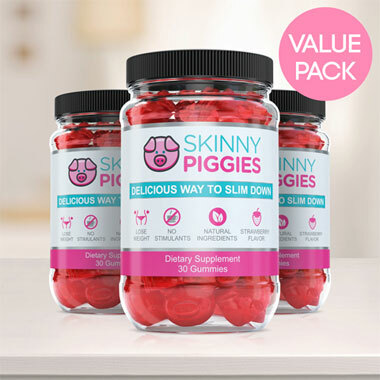 Skinny Piggies are tasty fiber gummies that naturally help reduce your appetite, meaning that your cravings will be soothed without you cheating on your weight loss plan. The science is surprisingly straightforward. Appetite is caused by two key things: the number of calories you eat and the presence of food in the stomach. After a meal, your stomach stretches from the food pressed up against the sides, that makes you feeling full and you stop eating. When you add Skinny Piggy gummies to your diet, you will feel fuller, faster. Taking a Skinny Piggy with a big glass of water just a half hour preceding eating lunch will cause it to expand in your stomach so that it takes up space and makes you feel you ate a substantial meal. This way you can lessen desire to eat and food cravings, hunger, and keep your caloric intake down, all without feeling like you're eating less than before. The gel also allows your stomach to empty slower leaving you satisfied longer. The longer you are satisfied, the less likely you will continue eating that enables you to eat much less calories. As the gel surrounds the food, it will slow down the digestion of sugars and carbs that flattens the level of glucose in the blood. By preventing sudden changes in your blood sugar level you reduce those intense sugar cravings. When you minimize blood glucose spikes by slowing down the absorption of sugars you are minimizing it from being accumulated as unwanted body fat and that then triggers your body to burn its stored fat. The slower the intake process the longer you remain in fat-burning mode. 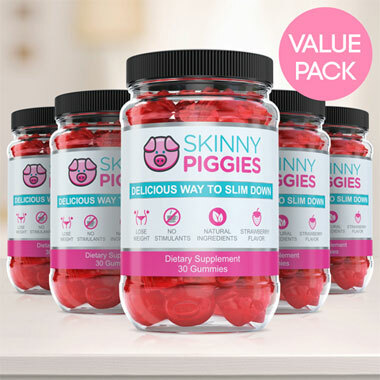 So you may be wondering, what's different about Skinny Piggies gummies versus some of the other weight loss natural pills you've seen online? First thing, our product have no artificial ingredients. Take a look at your average weight-loss supplement and you'll see a whole line-up of chemical names. Skinny Piggies contain no artificial additives: in fact, you can actually pronounce all the active ingredients. The nutritious, 100% natural ingredients in Skinny Piggies also have other benefits such as support for healthy looking skin, healthy looking hair and nails, and anti-aging properties. On top, Skinny Piggies contain no caffeine. That is a significant point to consider because if you consume stimulants, not only you will be suffering from exhaustion and fatigue afterwards, but it limits when you can consume them. Use a stimulant based fat burner in the evening and make no mistake about it, you won't be getting any sleep that night. With Skinny Piggies, you can eat them day or night without a problem. There are no restrictions with these gummies. And lastly, what other weight loss product is as tasty as a strawberry flavored gummy? 'Thought so! You will really like eating these so forgetting to take your supplements will definitely no longer be a stumbling block. They're easy to use and anyone can begin right off the bat. Try just one and we're sure they will become a highlight of your day.